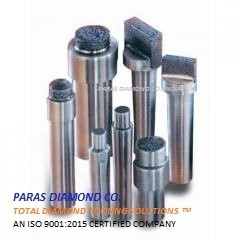 PARAS DIAMOND CO. make DG 10 - Grit Impregnated Multi Point Diamond Dressers are produced from special diamond grits. Bonding System holds the grits firm. 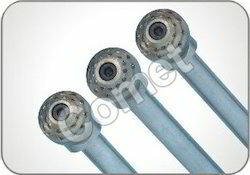 They are manufactured in Cylindrical, Cube and Rectangular Shapes, with different grit sizes and concentrations. Multi In this type of diamond dressers, the diamonds are mounted on a circular crown in such a manner that an angle of 90 degrees is formed between the circular crown and the operating plane. Once the diamonds get used at their current positions, the crown can be readjusted on the shank. Multi Point Diamond Dressers designed to give constant exposure of diamond edges and points, ensuring a consistent, smooth dressing action. Directly replaces single point tools but without the need for resetting due to point wear. HAS 7 CRYSTAL DIAMOND POINTS OPTIMUM FOR CLYINDERICAL AND CENTERLESS GRINDERS . We offer a comprehensive range of Multi Point Diamond Dressers, which is ideal to be used for application of rough dressing of grinding wheels. These comprise various natural diamonds and are utilized to the maximum possible extent without requiring any resetting or re-sharpening of the diamonds used in it. We offer these products to the clients at discounted prices. We have gained a remarkable position in the market that is involved in offering Multi Point Diamond Dresser. We rank on the top in by offering best quality of Multi Point Diamond Dresser. We are a most trusted name among the topmost companies in this business, involved in offering Multi Point Diamond Dresser.